When sixteen year old Raven Birchfield moves into her dead eccentric aunt’s house, things start to happen. While planting a flower in her yard for her horticulture class, Raven digs up an old nursery rhyme book and a quartz crystal necklace. She starts to hear someone calling the name Mary from the graveyard, and a raven keeps following her around. A girl is bullying her at school, and Raven is infatuated by the girl’s hunky boyfriend, Dex. And before she knows it, Raven in pulled into an alternate reality where she can not only hear Mary, Mary, Quite Contrary’s evil thoughts, but she’s in her body as well. 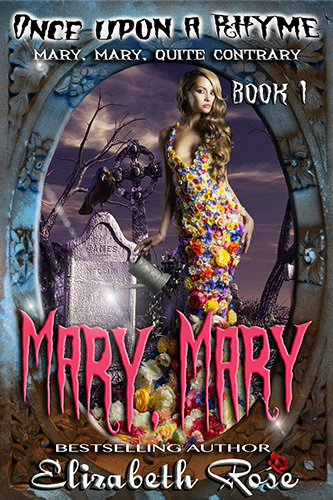 Being invited to see Mary’s garden wasn’t a good thing unless you wanted to end up dead. Of course, I didn’t know that . . . at first. Not until I ended up in the garden of the crazy woman herself. I thought Mary was only a fictional character from a nursery rhyme, but found out differently when I somehow started hearing the thoughts of her psychopathic mind. Actually, it was more than that. I wasn’t just visiting Mary, Mary, Quite Contrary. By some freaky unknown act of entering into an alternate reality, I was Mary, whether I liked it or not. It was my first month at my new high school, and I was enrolled as a Junior. I’d just moved to Half Horse, Illinois – yes that’s really the name – from Chicago, with my mother and little brother, Johnny. It was right after my eccentric Aunt Bestla died and we inherited her house and everything in it. “So, Raven, how do you like the house?” asked my mother, looking around the place like it was some sort of mansion though it was only a small bi-level and not really exciting at all. Not to mention, it was in southern Illinois so we were in the middle of nowhere. True, it was better than our tiny apartment in the city, but the place needed a lot of work. “Is this house haunted?” asked my younger brother, Johnny, looking around the place with wide eyes. Johnny had just turned thirteen but I swear he still acted like he was five sometimes. He wasn’t the bravest of kids, but maybe I was to blame for that, always scaring him whenever I had the chance. I know it was probably mean, but it was a good way to control him while we were growing up. He was small for his age so I knew he wouldn’t give me trouble. I knew exactly what she meant by that. She was speaking of the fact my father had deserted us on Johnny’s seventh birthday and we hadn’t heard from him since. My mother raised us on her own. A neighbor watched over us for awhile. Then my mom couldn’t afford to pay her anymore and we were latch-key kids from then on. Since I was three years older than Johnny, I more or less took over the role of mother when she was waiting tables at the local restaurant nights to make ends meet. Her day job was working as a receptionist. So, basically I raised Johnny. Mother was so angry with what my father had done, she vowed to never have anything to do with the Birchfields – his side of the family again. I’m not sure what she meant, but she’d called him crooked. Actually, I think her actual words we’re, All the Birchfields are no-good, crooked, and mentally unbalanced. I won’t be raising my children around lunatics. I had to agree with her on that last part. I remember my father’s stories about his sister, Bestla. They were such bizarre stories that I’d never forgotten them. Supposedly, Bestla had odd habits of talking to animals and people who weren’t there. My father also used to say that she seemed to have multiple personalities. One minute she was sweet and kind, and the next moment she was vile and would race after complete strangers with knives in her hands and spewing incantations. She was eccentric, as he’d called her. All the other members of my family on my mother’s side just called her crazy. Since I’d only met her a few times when I was very young, I couldn’t take a side one way or another. But now that we were living in her house with all her belongings, I had to agree with my obnoxious little brother – the place really did look haunted. I wandered over to the old bookshelves in the dining room that lined an entire wall and reached all the way up to the ceiling. Dust covered every inch of the place. Half-burned drippy wax candles, and quartz crystals in every shape and size were everywhere. Strange figurines and books about herbs and things called Feng Shui and Finding Your Inner Goddess lined the shelves connected by spider webs which made me shiver. I could tolerate a lot of things, but something about bugs – especially spiders – made me cringe and turn into a bigger scare-baby than Johnny. Aunt Bestla’s furniture wasn’t normal either. The chairs in the living room had stars, moons, and even dragons on the worn upholstery. Springs stuck out from under the old loveseat against the far wall. I glanced over to the midnight black swivel-stool in front of the creepy old piano. It was a claw-foot stool. Actually, the feet looked like demon claws holding onto glass gazing balls. “Ok, so maybe she was a witch,” I mumbled and headed over to the living room window. The drapes in the house were all drawn, and it was dark as well as musty in there. I wanted some sunshine and fresh air. I also wanted to get a better look at some of the odd things atop the piano. So I cautiously reached out and pulled the burgundy drapery aside to reveal torn lace curtains underneath. A big, black spider shot out and crawled across my hand. I screamed and shook it away, and jumped probably a foot in the air. My heart raced a mile a minute and I started to feel queasy. I turned and ran back to the kitchen where my brother was still standing with his mouth open. He reminded me of that hideous stone gargoyle at the end of the driveway atop the brick structure that housed my aunt’s mailbox. “Close your mouth, Johnny, or a spider is going to find a home inside,” I told him. He closed it so fast that he bit his tongue. It was funny, and made me laugh and forget about the spider anyway. My brother’s eyes were wide. He glanced around the room as if he thought a ghost were going to pop out and get him. Then he crept forward slowly, raising up on his tip toes to look over the sink, out the kitchen window. I couldn’t help myself. The opportunity was just too enticing. I snuck up behind him and grabbed his shoulders. “Boo!” I said, and started laughing, because I swear he jumped higher than I had when I saw the spider. Not to mention, he screamed so loud I’m sure they heard it all the back to Chicago. This sounds like a good book. I just added it to my TBR list.